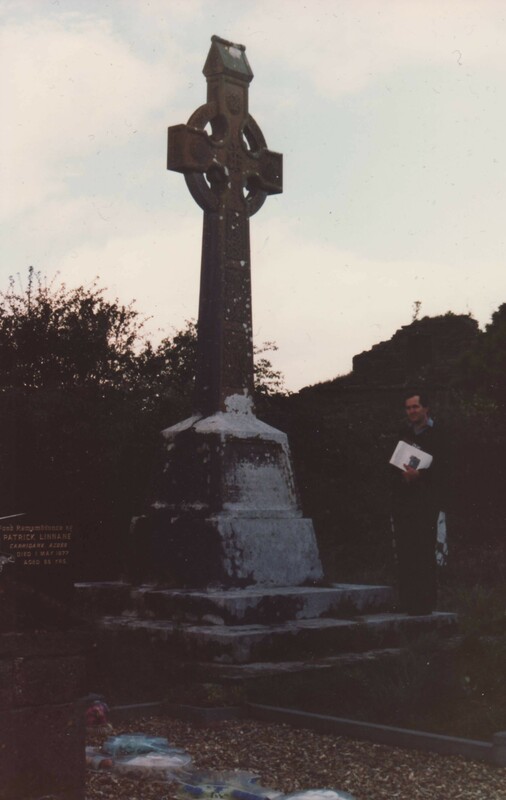 Grave of Richard Rahilly, Lislaughtin Abbey, near Ballylongford, Co.Kerry. 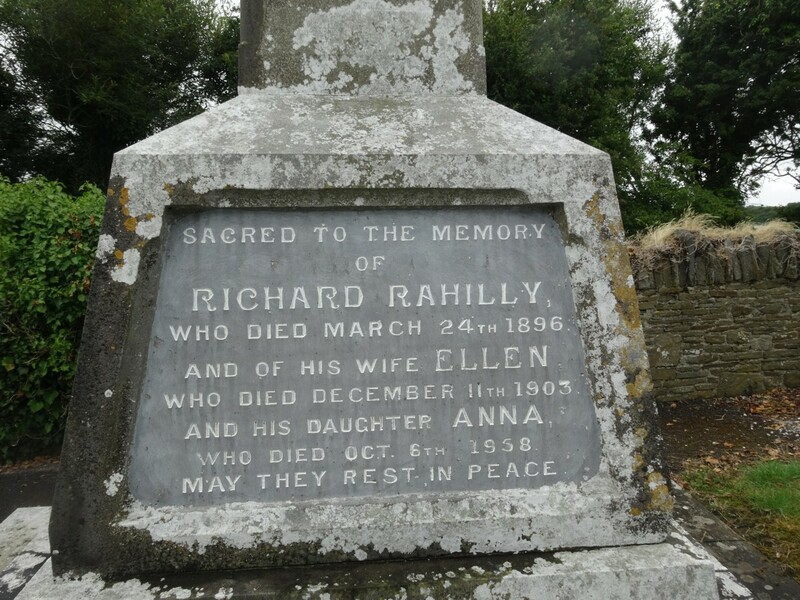 Richard Rahilly was buried here 1896. 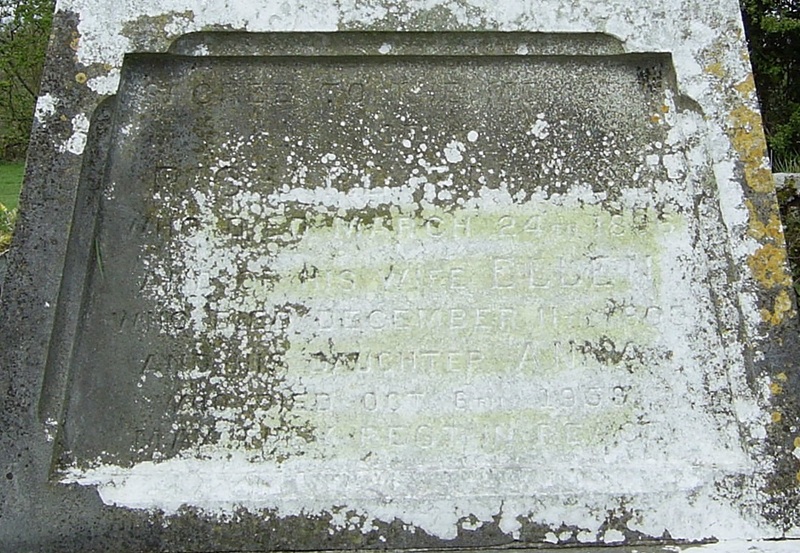 His widow Ellen Mangan died Dec 1903 and was buried here. 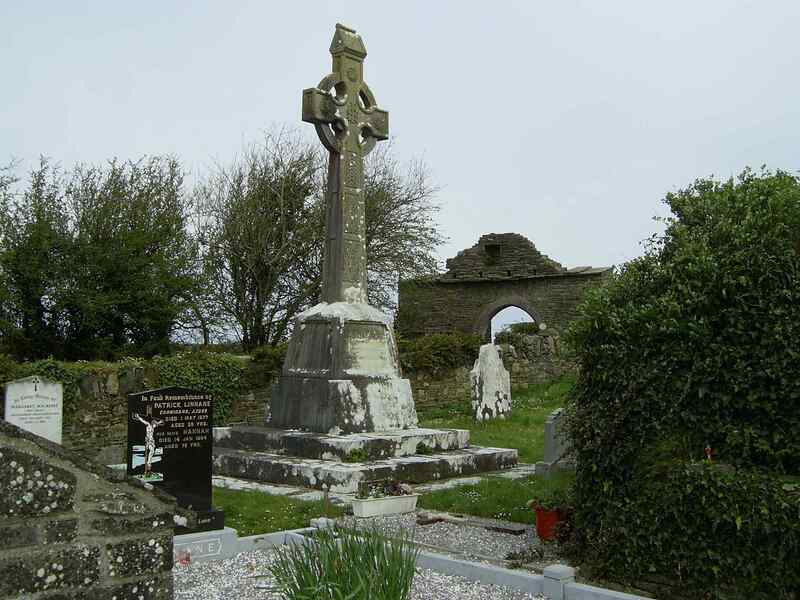 Their dau Anno O'Rahilly died 1958 and was buried here. 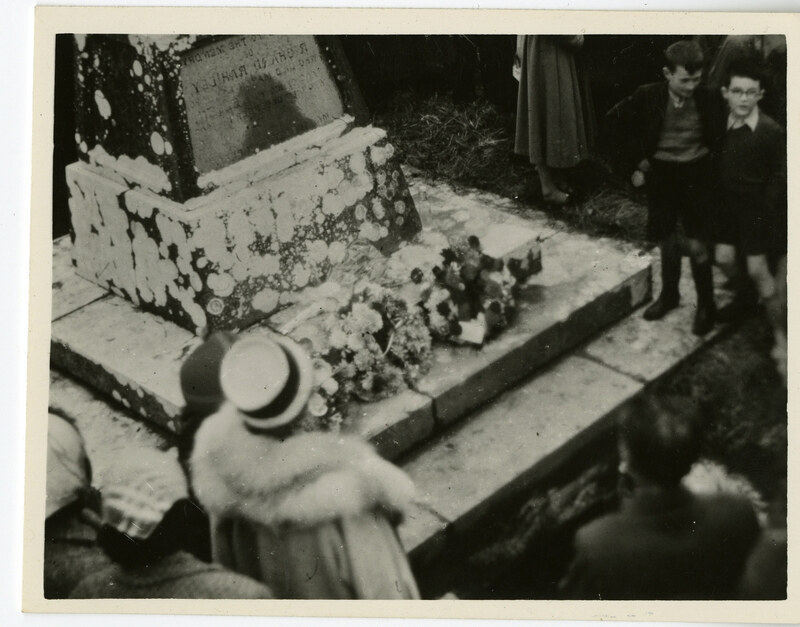 The grave of Richard Rahilly, Lislaughtin Abbey. 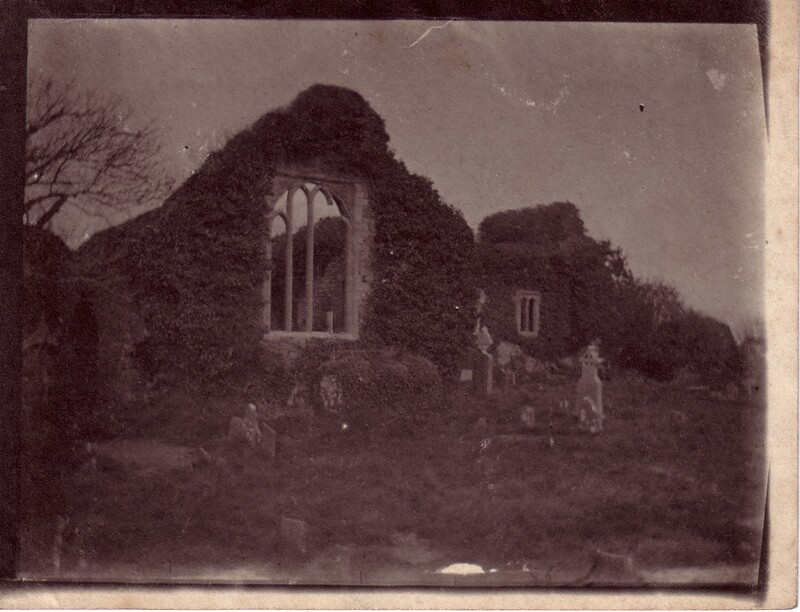 Photo some time between 1896 and 1903 (Richard Rahilly inscription only). See larger and full size. 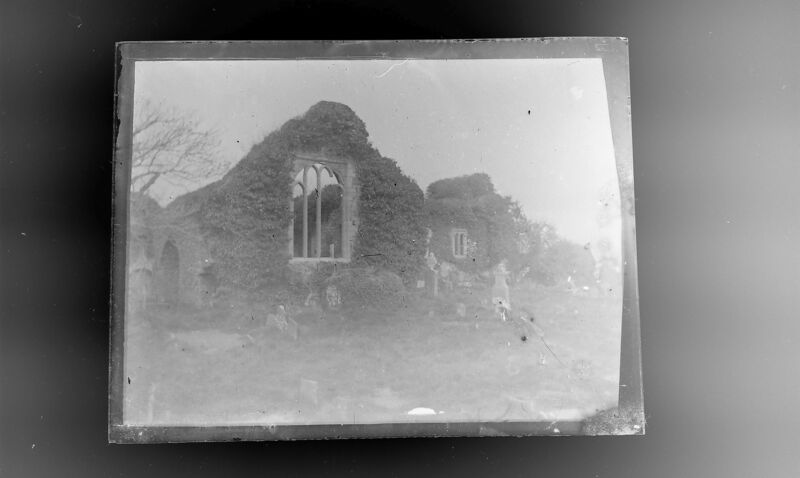 Image 5851 in Humphrys glass negatives. Light-adjusted. See original. 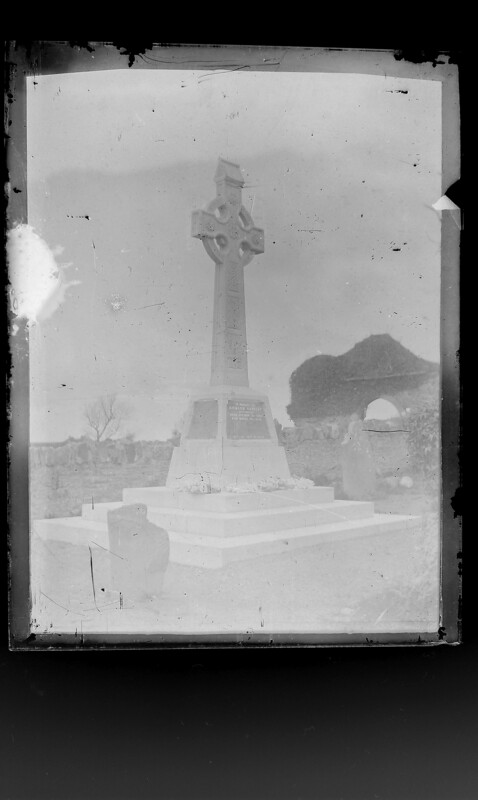 There is a vault underneath this cross. 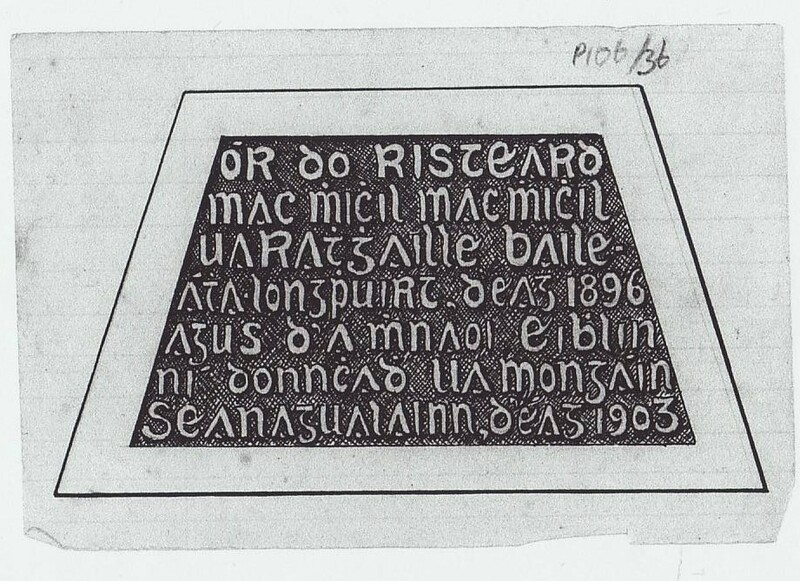 After his son Robert died Aug 1903, and his mother died Dec 1903, The O'Rahilly drew up (probably in 1903-04) plans for a new gravestone at Lislaughtin Abbey with an Irish language inscription. Above is [P106/36]. 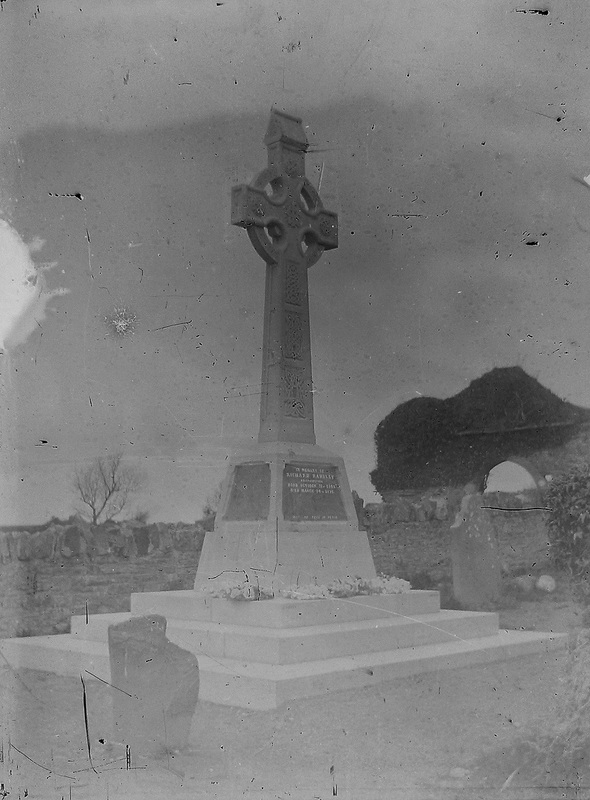 Inscription: "Tomb of Richard, son of Michael, son of Michael, Rahilly, of Ballylongford, died 1896, and his wife Ellen, daughter of Denis Mangan, of Shanagolden, died 1903". 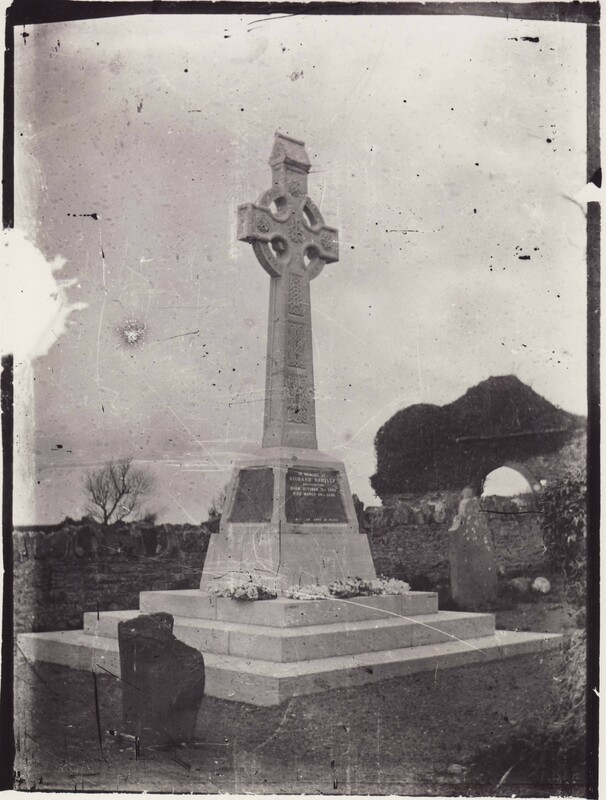 Another proposed inscription was (the Irish for): "Tomb of O'Rahilly. 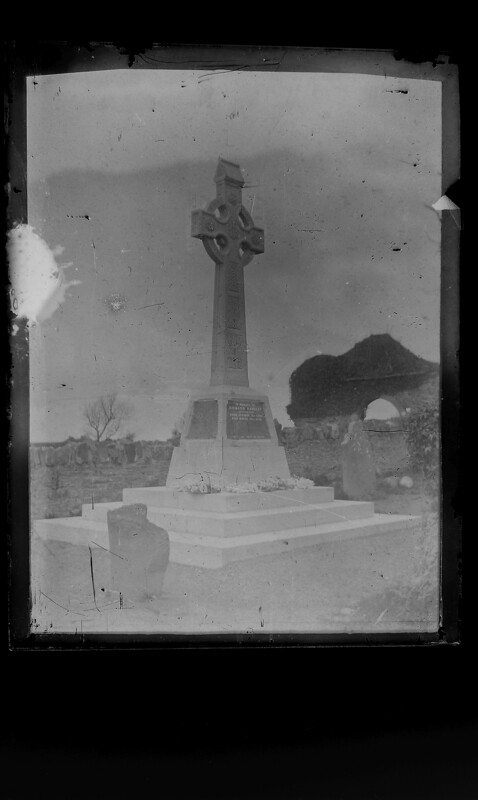 Richard son of Michael son of Michael, died 1896, and his wife Ellen Mangan, died 1903, and his grandson Robert son of Michael, died 1903". (todo) See [P102/80] and [P102/43]. 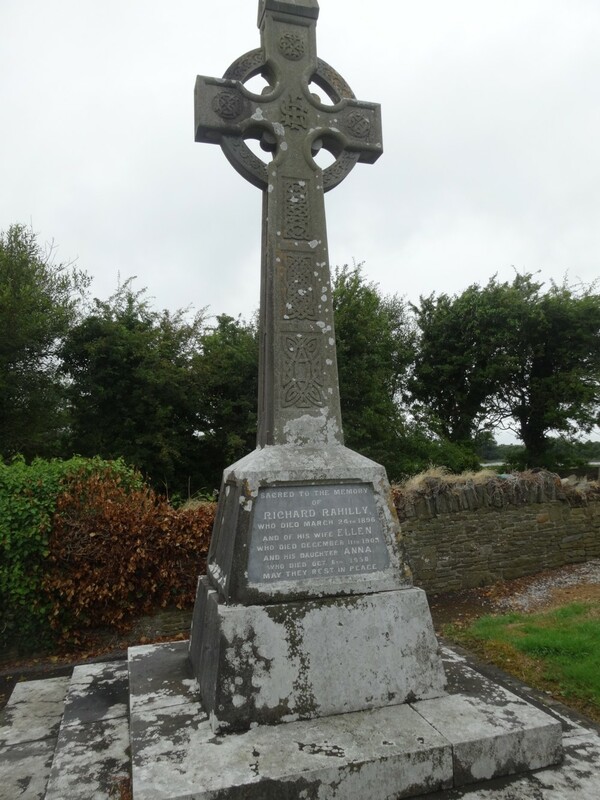 A new Irish gravestone was not erected, but the old one was changed. 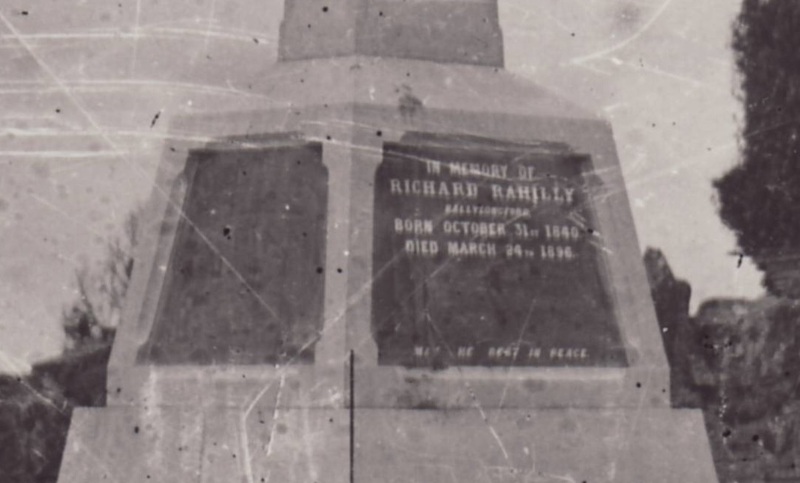 The grave of Richard Rahilly. Flipped left-right. See larger and original. 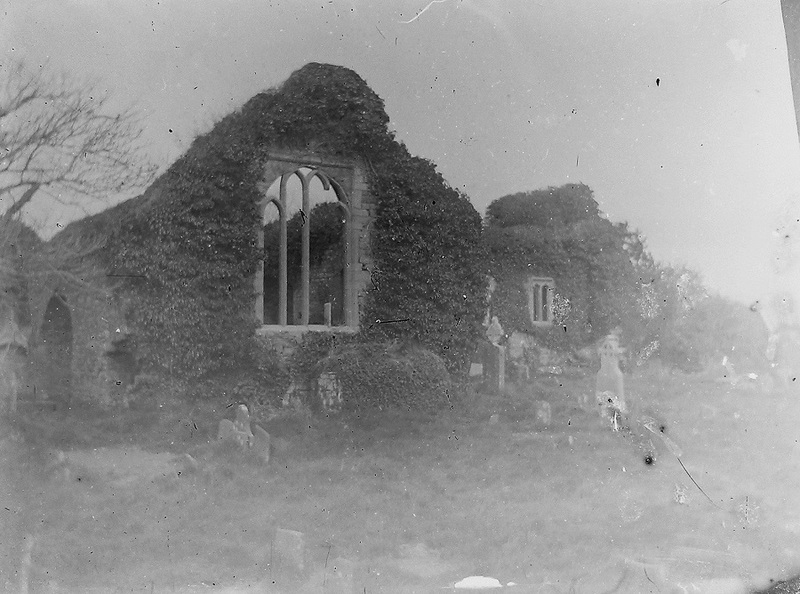 Photo 1985. See full size. See full size and alternative shot. See alternative (courtesy of Richard Humphreys). 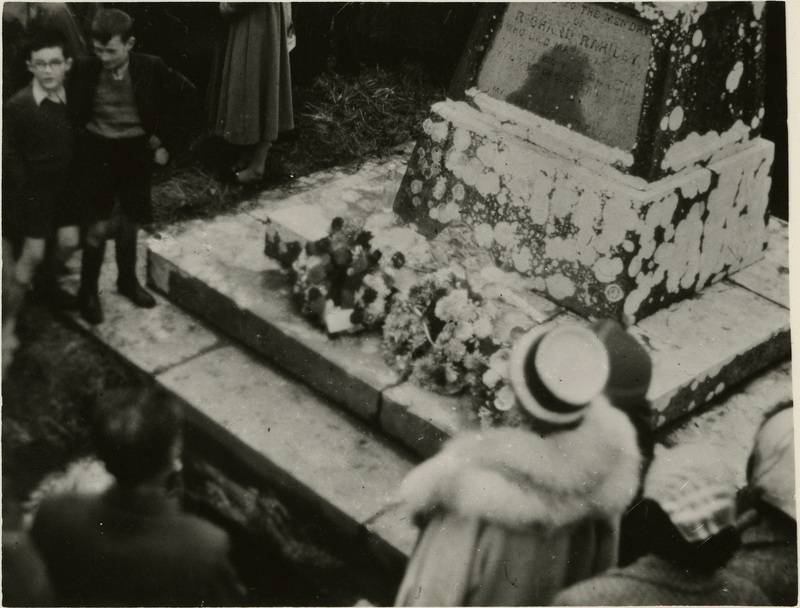 The grave was cleaned up in 2006-2010. Photo 2014 courtesy of Stephen Barrett. 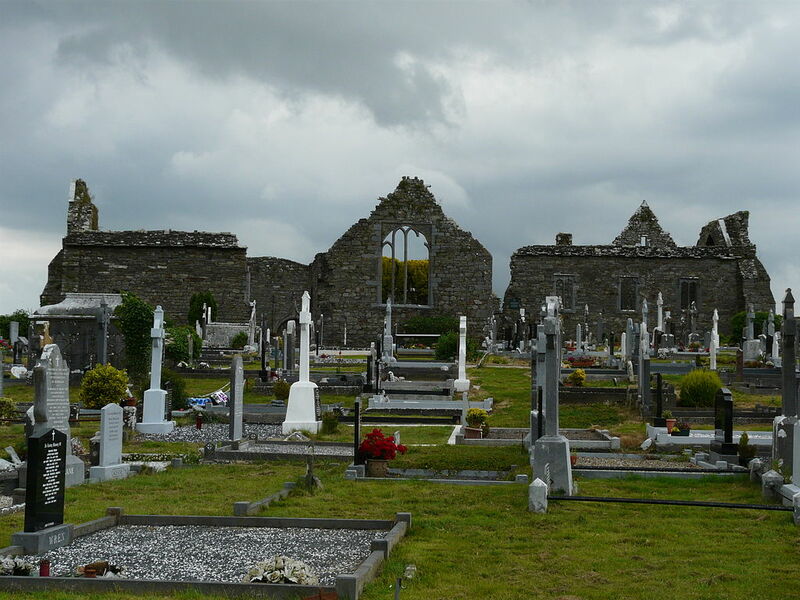 Lislaughtin Abbey is a ruined 15th century Franciscan Friary, just NE of Ballylongford, Co.Kerry. See street view. 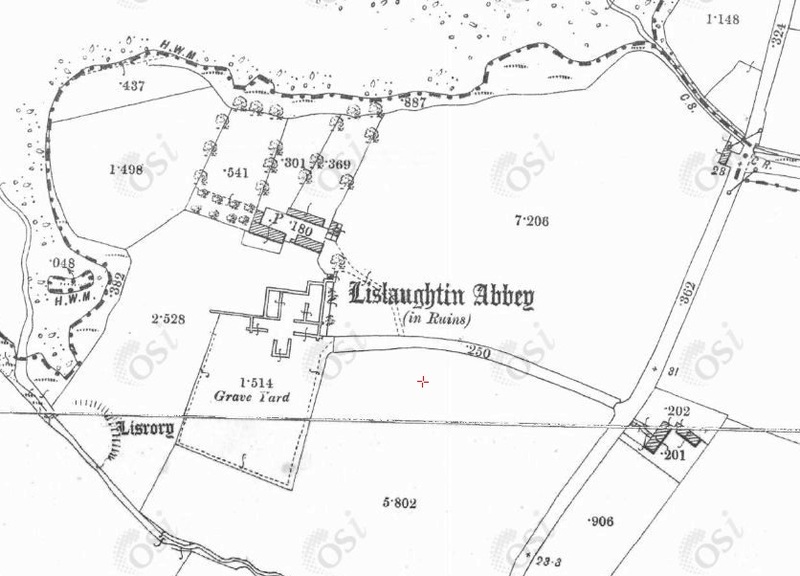 Lislaughtin Abbey on 1887 to 1913 map. See larger and full size. Image 7156 in Humphrys glass negatives. Light-adjusted. See original. The same view of Lislaughtin Abbey in 2009.